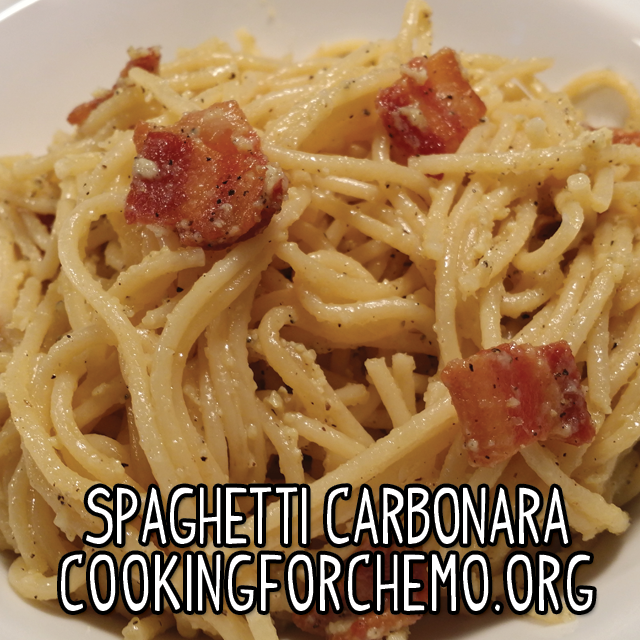 A delicious take on the classic Spaghetti Carbonara. This recipe should taste peppery, cheesy, and savory. The weight of this recipe is heavy but can be balanced with Italian flat leaf parsley. The texture of this recipe is dry and noodley. This recipe is good for people with low treatment side effects. This recipe gives an emotional response of a good Italian meal at a fancy Italian restaurant. This recipe is best categorized as authentic Italian. Bring a large spaghetti pot with well-salted water to a boil. In a large sauté pan, begin to cook bacon over medium heat. When water reaches a boil, add pasta and cook. In a bowl on the side, whisk together parmesan, black pepper, and eggs. When pasta finishes cooking, strain and leave in colander. Bring bacon pan heat to high; make certain bacon is extra crispy. Toss pasta into bacon pan taking care not to burn the pasta but to toss the bacon grease and bacon thoroughly through the pasta until even. Once pasta is evenly coated, vigorously whisk egg mixture. Turn off heat from pan. Pour egg mixture on top of pasta and stir vigorously. The key is to not allow the eggs to cook from the heat of the pan but from the heat of the pasta itself. If your pan is too hot and your pasta is too cold, you will end up with parmesan scrambled eggs and pasta. If you do it correctly, you will end up with pasta that is perfectly coated with parmesan and black pepper as if it was baked into the pasta from the beginning. When finished, top with Italian flat leaf parsley to help with the weight of the dish. This pasta dish can be a little heavy so serve in small portions.